It’s almost winter and visions of steaming mugs of glühwein and the sweet taste of stollen are dancing in my head. 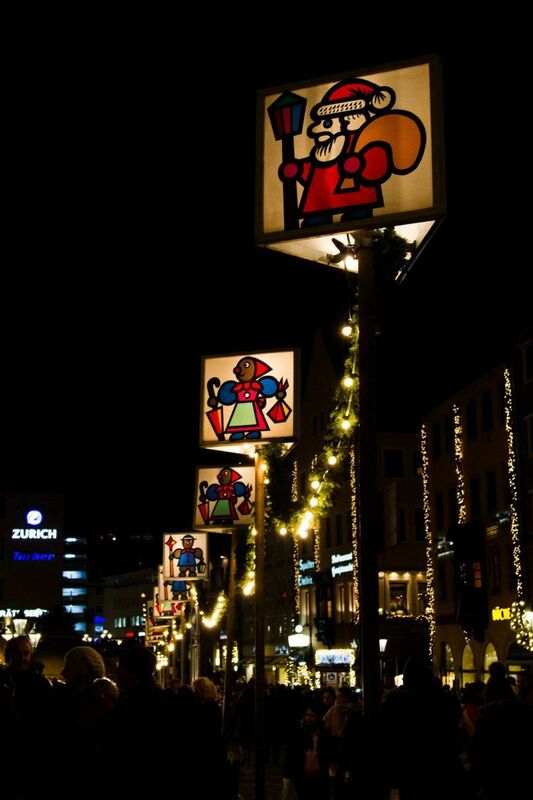 In Germany, the onset of winter brings one of my favorite seasons of the year – Christmas market season! 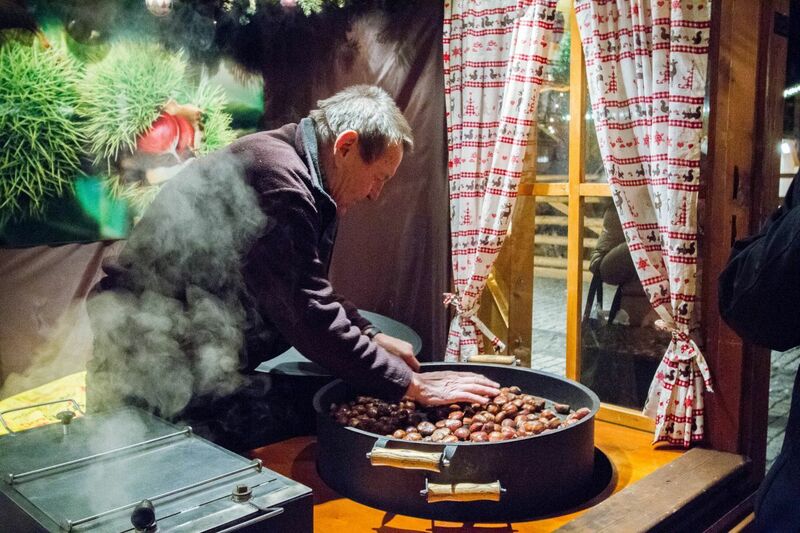 Hot chestnuts are just one wintry specialty you can try at any Bavarian Christmas market. Living in Bavaria, I’m smack-dab in the midst of the quaintest, quirkiest, and even oldest Christmas markets in Germany. 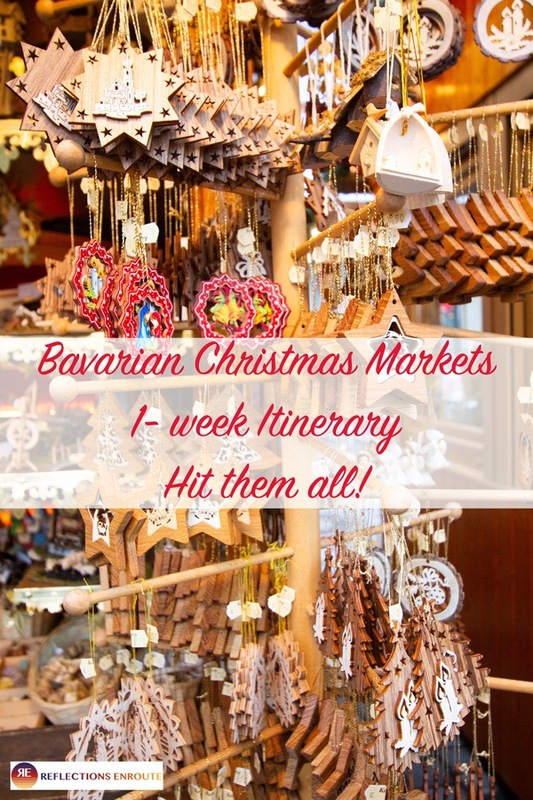 If you haven’t done a German Christmas market yet, book a flight today and I’ll tell you how to get around to the best of Bavarian Christmas Markets in one glorious, shopping bonanza week. 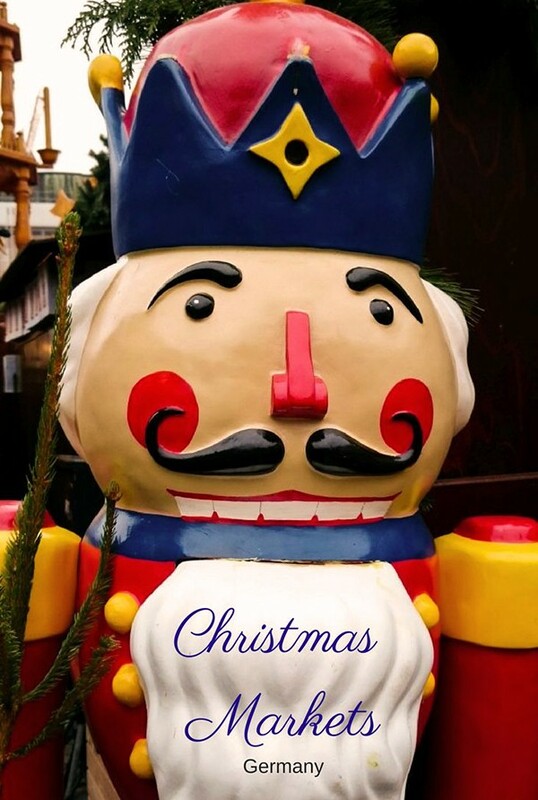 Which Bavarian Christmas market are you most looking forward to? 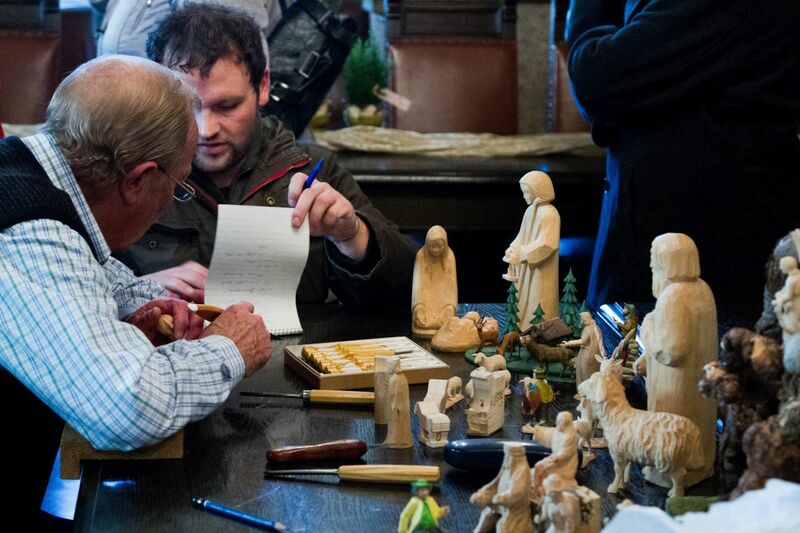 Local artisans plan and carve creche figurines for a customer. After that long flight, you are going to need an immediate Christmas market fix, so after checking into your hotel, head straight to the center of Munich to the Marienplatz. This traditional market will get you into the holiday spirit with your first cup of mulled wine, or glühwein, which you can find in many stalls. If this is your first market, you will notice that the wooden stalls, decorated with fir boughs and festive wooden signs, really gets you into the spirit. 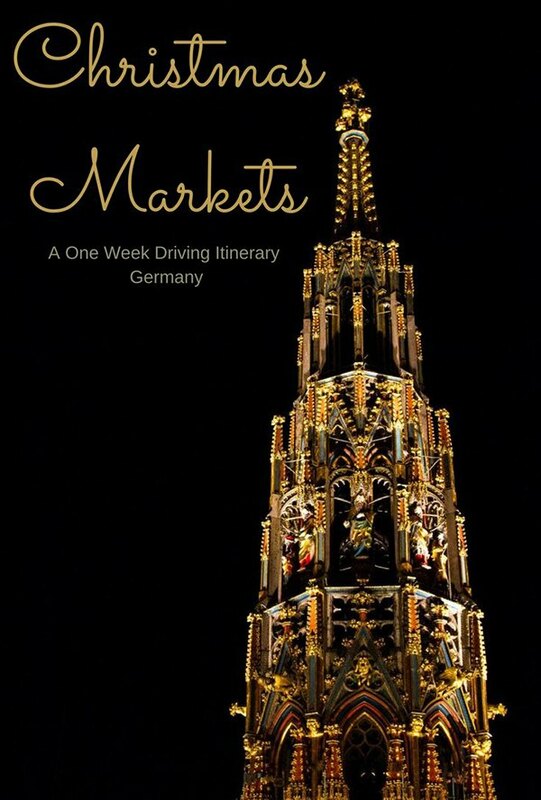 The capital of Bavaria has many Christmas markets to explore, so I would recommend spending two full days here. 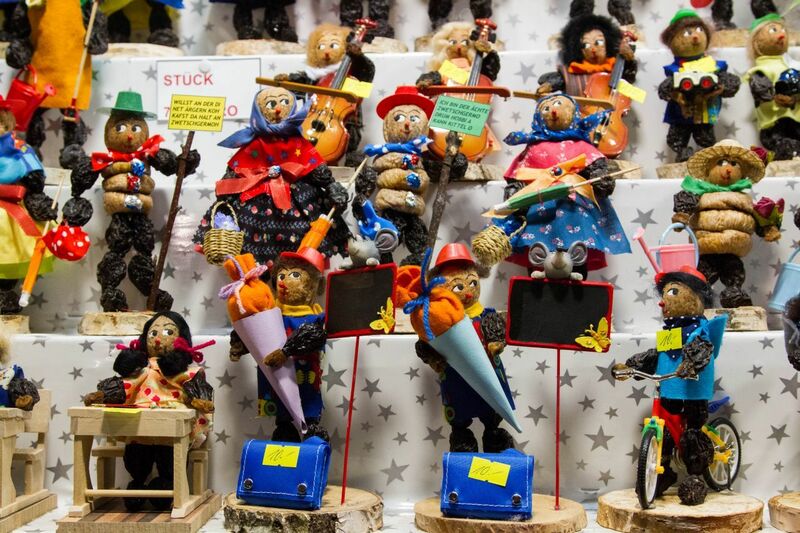 One of the most traditional markets in Munich is the Kripperlmarkt where you can buy handmade creche figurines as well as other wooden carvings. To explore further you can find a medieval market, a handicraft market, and even a pink market. They are all fun! While in Munich don’t miss your opportunity to visit the world-famous Hofbrauhaus! It’s guaranteed to be crowded so just look for a table with enough spots and ask if it’s open. People are expected to sit together to eat, drink, and of course be merry. Eat a roasted pork knuckle and drink some great beer while listening to the oompah band. It’s a Bavarian experience that you will remember for a lifetime. You can head over there after watching the world-famous glockenspiel in the Marienplatz at 11:00 in the morning where wooden figurines joust high up in the clock tower. Plum or prune people figurines of all types can be bought at the Nuremberg Christmas Market. One of the most famous Christmas or Christkindl markets in Europe, Nuremberg, opens their season with the Christkind, one of the girls from the city, who descends and opens the market. If this is something you are interested in, this year the Opening ceremony is on Nov 25th at 5:30 PM. 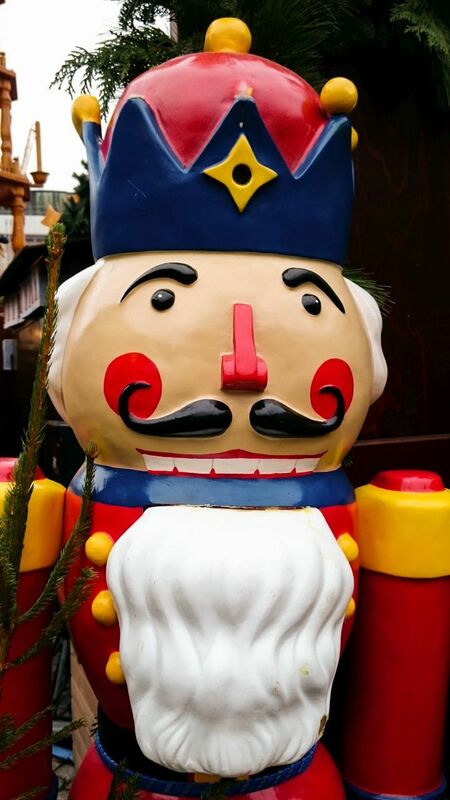 Nuremberg is home to the famous cookie of Christmas, lebkuchen, and there are many stalls selling it to eat right then or wrap and give as gifts. Another tradition in Nuremberg are the prune men. Figurines made out of prunes are for sale at some of the stalls. As you walk through the old town, you will also come to a portion that holds a special market just for kids where they can go on rides and eat schneeballen, a local pastry covered in sugar or chocolate. Schneeballen, a tasty pastry covered in chocolate. Kids love them! Nuremberg, famous for the World War II War Crime trials, is a great little city with plenty to do other than Christmas markets. Visit the castle, Albrecht Durer’s house, and by all means eat some Nuremberger würstchen, or little sausages made right there. They are usually served with sauerkraut, but don’t forget to order a pint of beer to wash them down. One of the many glühwein stalls you will find at any Bavarian Christmas Market. Located in the beautiful area of Germany called Lower Franconia, Wurzburg has a beautiful Christmas market that is well worth the visit. 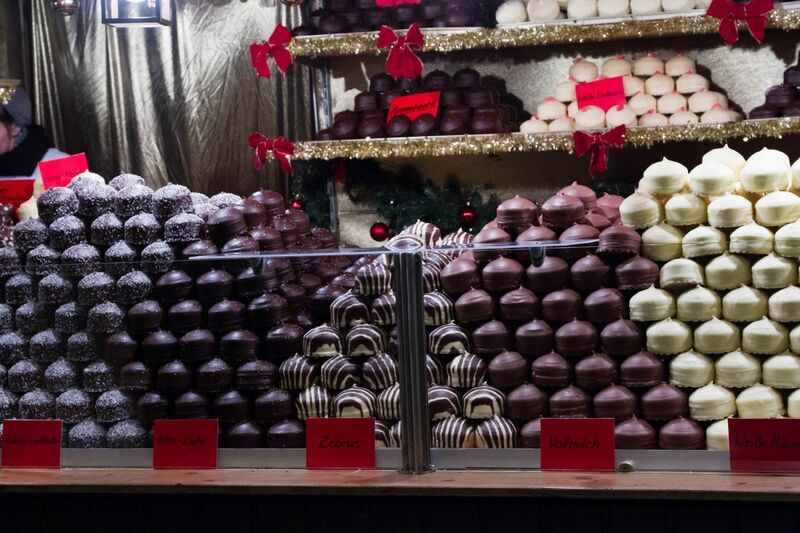 The stalls boast everything from traditional Christmas items from nutcrackers to wooden candle pyramids, but there’s also plenty of delicious foods like the dampfnüdel or germnüdel. 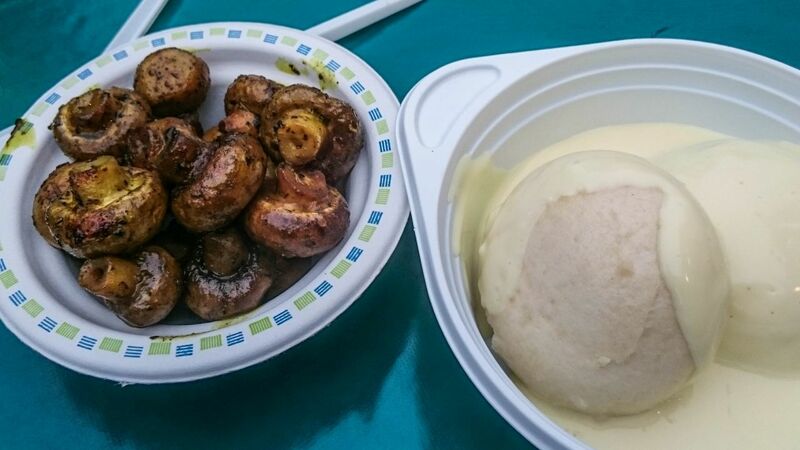 These are yeast dumplings that are steamed and served with vanilla sauce. The dampfnüdel are plain, but the germnüdel usually is stuffed with plums or sour cherries. Both versions are served hot and are a must try while in Bavaria. Yum! A midday snack of mushrooms then a dampnüdel for dessert. One of the best parts about visiting this city is a visit to the UNESCO World Heritage Sight, Wurzburg Residenz, where Franconian Prince Bishops made their homes. Or travel a little way up the hill to Festung Marienberg. Both the palace and the fortress demand a visit and are easy to get to on public transportation. Also, while in town, drink some Franconian wine. Different than other parts of the country, Franconian wine is special. Try a Bacchus or a Silvaner if you’re into whites, or a Domina for the red. All are delicious and come in a uniquely shaped bottle called a bocksbeutel. Pick up one or two of these excellent wines for gifts, they’re delicious! 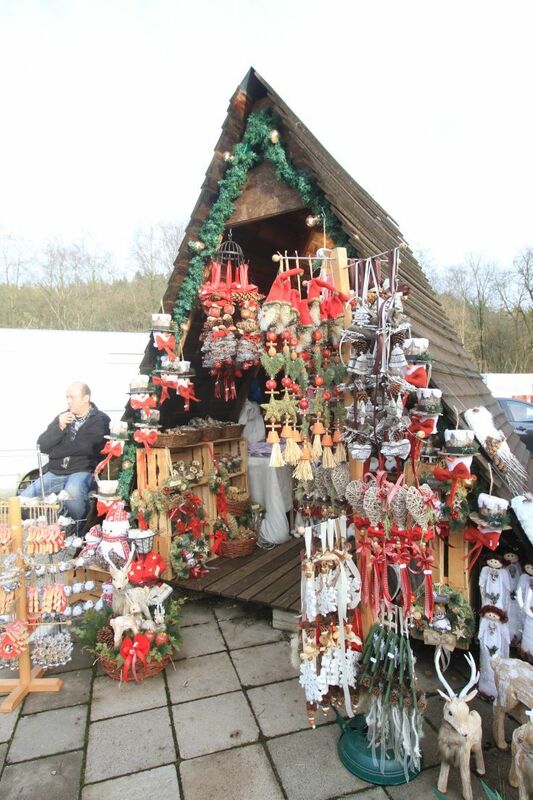 Traditional gifts of all kinds can be found at any Christmas market. Bamberg’s downtown area is a world heritage site, and as soon as you start walking around you can see why. The half-timbered houses and old town hall are beautiful examples of German architecture. Lucky for you the Christmas market wends its way through the entire walking area, and you can’t go far without finding another quaint vendor stall with something to buy for your friends and family back home. While in Bamberg, be sure to visit the old city hall, built on an island in the Regnitz river. Crossing over a number of bridges give you an absolute stunning view, and there is always a booth nearby to sell you that special warm drink. Don’t forget to visit the Dom, it’s mighty impressive as well. You will fall in love with this gorgeous city, I promise. 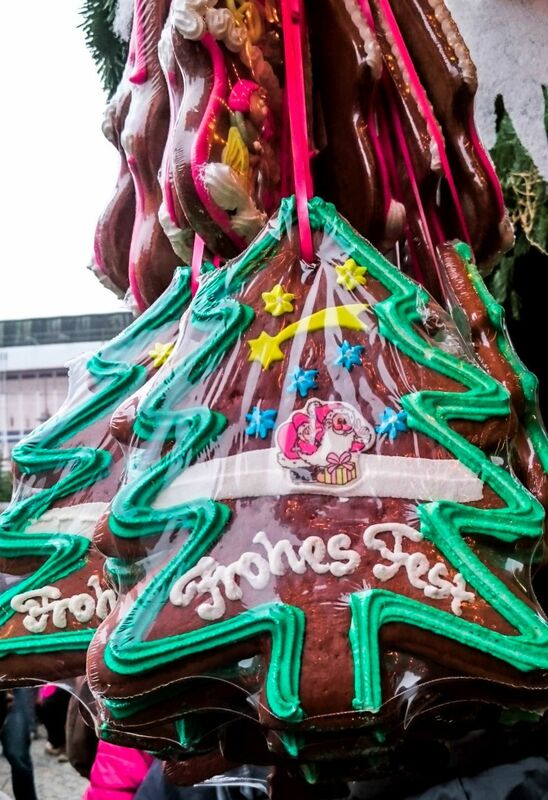 Gingerbread hearts and other shapes are big sellers at the Bavarian Christmas Markets. This UNESCO World Heritage City hosts four Christmas markets. There is the traditional one in the downtown area, a handicraft or Artisan’s Lucreziamarkt, an Advent market, and, by far everyone’s favorite, the romantic Christmas market at the Thurn and Taxis palace (entry cost 7 Euros). 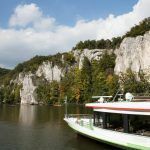 Regensburg is one of the few places that you can try a warm bier known as “gluhbier” along with your traditional gluhwein, and the city is also famous for their special sausage sandwiches called the Knackersemmel. Another UNESCO World Heritage city, you can easily find more things to do than just these magical Christmas markets. The old stone bridge, built in the 12th century is a medieval marvel, and the architecture around the city is some of the most beautiful in Bavaria. Don’t miss the historical museum, the Goliathhaus, and even Oscar Schindler’s house. 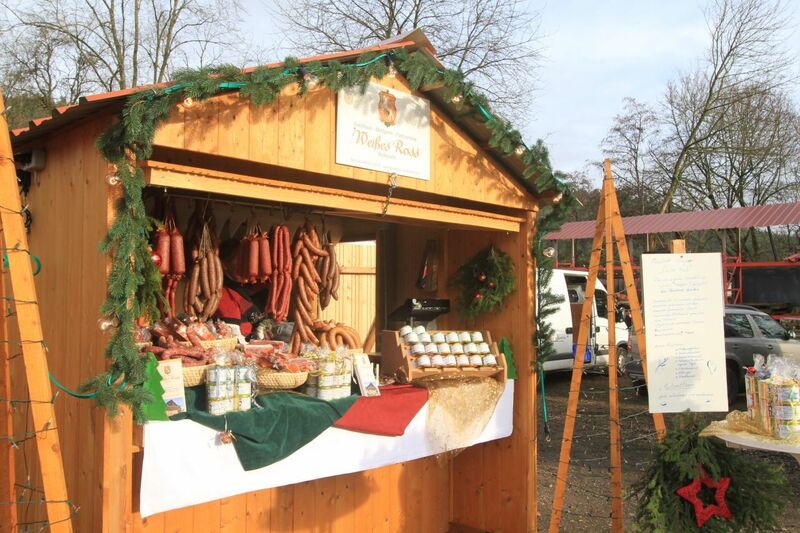 You can find everything German at a Bavarian Christmas market…even sausages! 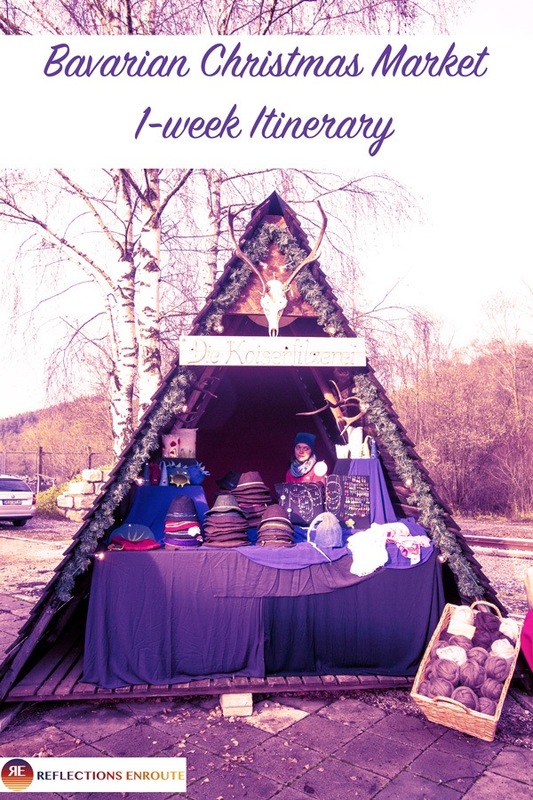 A few things to know about Christmas markets. In the larger cities, the markets run continuously from the last weekend in November (either the 23rd or 24th) until right up to Christmas Day. However, there are plenty of smaller, quaint towns that will only be open for a week or a couple of weekends during that time. You will want to check the schedule to see which ones are open during the time that you choose to come to Bavaria and make sure to hit some of those smaller ones as well. All Christmas markets sell wonderful fest food, so they usually open about 11:00 in the morning to catch the lunch crowd. The best time to go, in my opinion, though is in the evening and into the night. There are plenty of lights, and standing around sipping some hot cocoa or glühwein and watching the shoppers is a great way to pass some time. I like to walk around, get some ideas of what to buy, then warm up inside at a restaurant for dinner. After which I return and hit those stalls to buy those items that have stuck with me, and I just can’t live without (or my relatives can’t anyway). As you are wandering the markets, you will notice that every food and drink stand charges a pfand or deposit for their plastic or glass bottles and dishware. This includes the mug that will have the name of the Christmas market on it. You have to pay the pfand, eat or drink the goods, and return the dishware to the stall to get your deposit back. If the lines are long, don’t worry, you can either cut the line or go up politely on the side and they will return your pfand. If you’re crazy in love with the glühwein mug, and let’s face it, you will be, simply keep the mug and forego your deposit. Another great souvenir for your memories! First, fly right into Munich. You can fly into many airports in Germany, all of which are situated near some good markets, but for those traditional Bavarian markets fly right to the capital of Bavaria itself. Now you have your first choice. Should you train or drive? Both are easy and safe. Taking the train might be a little cheaper, and you don’t have to worry about much except making your connections, but driving gives you tons of flexibility, especially if you’re interested in some of the smaller markets. It’s up to you. The most important thing you need to know about the train is that you do not book your tickets ahead. Really, don’t do it. I know you are tempted, but there is absolutely no reason to worry. You will get a seat and it will be cheaper to do it day by day. Here’s why. There’s a special daily fare for traveling by rail around the state of Bavaria. It’s called the Bayern Ticket and it costs a mere 23 Euros for one person (28 for two, 33 – for three, 38 – for four, and the max is five people for 43 Euros). You have to leave after 9:00 am and you do have to ride 2nd Class, but so what? All German trains are clean and quiet. You will love it. If you decide to go by train, you can choose to stay in Munich at the same hotel for the full week, because your return ride is included as long as you return before 3:00 in the morning. Starting off and finishing in Munich is key! On your way out of the country, you can make sure to have one last glühwein or bratwurst at the Christmas market held right in the airport. That’s right, just in case you didn’t quite finish all of your shopping, you have one last chance. The Flughafen Christmas Market is complete with an ice ring and plenty of handicrafts and great food. It’s guaranteed to be a fitting end to your trip! 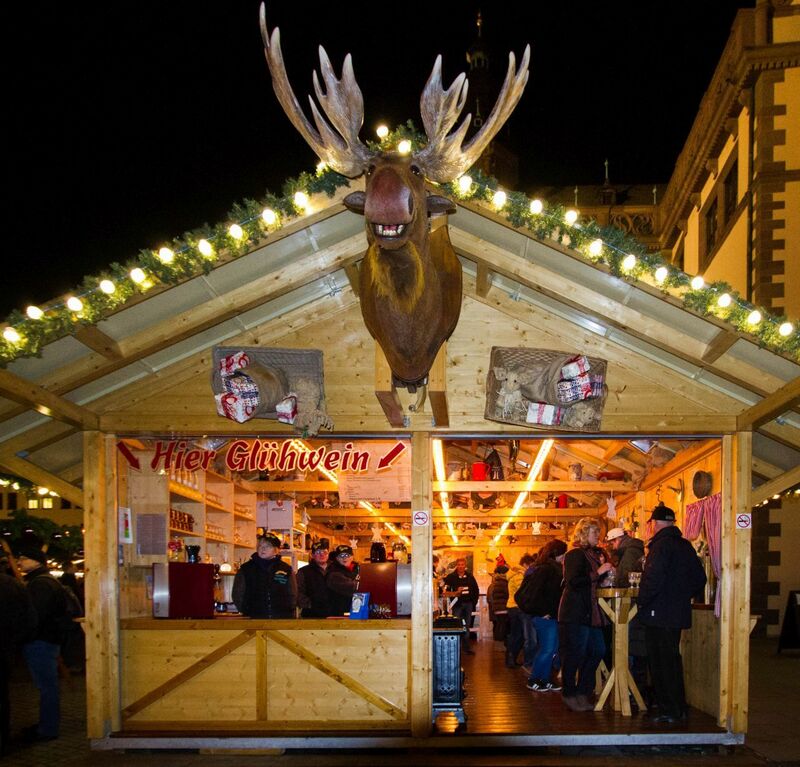 Pin The Big 5 Bavarian Christmas Markets for later! Kassie, I hope you get to do this. It’s so fun! I have never been to a real German Christmas market but I have gone to one outside of Germany. It was lovely, from your post looks like I need to go find myself the real deal. Rachael, I think you would really enjoy it. They are fun, but cold! Bookmarking this post for future reference! I’ve never been able to visit any of the Bavarian Christmas markets and it’s on my list of to-do’s for the future. Here in Chicago we have a small Christkindlmarkt which is a lot of fun, but I can imagine the real thing would be stunning. Love me so gluhwein and stollen! And thanks for the tips on the pfands, which are super helpful! Emily, I hope you do get over here and do some German ones. You would really love them. Cool! Scott and I are always looking for new Christmas market ideas. We’re going to Berlin this year but Munich is on our list too. Thanks for sharing all these great ideas. Jenn, As always let us know when you are in our area! Have fun! Anisa, I do hope you make it. They are nothing short of magical! I envy you for being able do visit all these Christmas Markets. Unless you live there, how many times can you travel to Europe in winter? The only one I’ve seen is the one in Munich. Sometimes I miss Europe badly. Anda, Yes, but if you come at the right time you can see many Christmas markets. Mary, It is fun. Christmas markets really feel like Christmas. We love them. Jonny, It’s definitely one good reason to go! 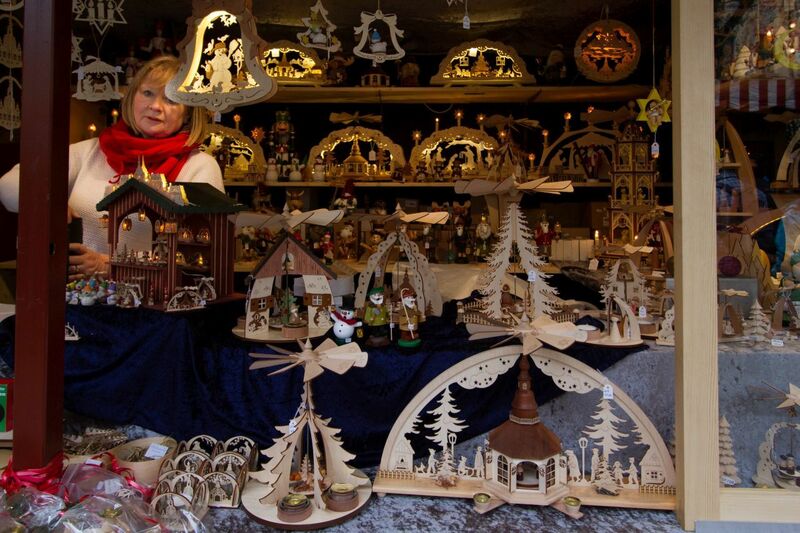 I’ve always wanted to visit a traditional German Christmas market, this looks incredible! Alice, They really are as Christmassy as it gets! You would love them. Lisa, I know exactly what you mean. I was walking through Chinatown and it made me homesick for living in Asia. Funny. Angelina, The Germans are so efficient at cleaning off the roads, so driving in winter isn’t bad at all. The trains, of course, are even easier. Wonderful! I love shopping 🙂 This Christmas I would definitely try to visit…Fingers crossed…Lets see. Priya, You should go, then. It’s so much fun! Usha, The Christmas markets in Bavaria are so magical. You’ll love them.